On May 3, during a grand concert at Madison Square Garden in New York, Pete Seeger, "a living legend of the American song" as Silvio RodrÃ­guez called him in a letter written that same day, received a tribute for his 90 years. The greatest poet of Cuban song had been invited to the concert, but, against his own expectations and those of the organizers, the U.S. Department of State did not give an answer on his visa request and Silvio was unable to sing Guantanamera alongside Pete Seeger, the man who in the convulsive 1960s, added JosÃ© MartÃ­Â´s Simple Verses to JoseÃ­to FernÃ¡ndezÂ´s song, making it the most universal of Cuban songs and at the same time laying a bridge for affection to go through at a moment when all other bridges had been broken. Did the procedure for obtaining the visa make you predict this outcome? I had requested visas several times to enter the United States and they had refused. However, I thought this time they would give me a visa, why …? more than anythingÂand I’ll wear my heart on my sleeve hereÂbecause I had heard the President of the United States saying that he was willing to come closer to Cuba, and I said: now they will give it to me. Especially considering those who had requested my visa: the family of Pete Seeger and Pete Seeger himself, for whom a tribute was going to take place at Madison Square Garden on the occasion of his 90th birthday by means of a concert that was going to be dedicatedÂwas indeed dedicatedÂto Pete SeegerÂ´s Clearwater Foundation, an ecological organization that promotes clean waters for the Hudson River, something that, among other things, he has been advocating for many years now. In other words, I thought that they would give me the visa… I mean, there was always the possibility otherwise, but I thought that conditions had been created for a visa to be given to me this time. But the procedure for a visa to the United States always has its complexity. During the application process, did you notice any treatment that could indicate this would be the response or no response? What was curious though was that when I was going to be interviewed at one of these windows, I noticed that the officers from other windows started to gather behind the lady who was interviewing me. I thought that it was a bit funny, because they made a small rally behind the person interviewing me. I watch them looking at the computer in front of the lady and murmuring, saying things. I was wondering what that computer could be saying for a simple interview to have caused such commotion. Finally she, who of course treated me very politely, told me: "Our boss will finish interviewing you." besides, President Obama had said what he had said, right? How special is your relationship with Pete Seeger? Why do you think they included you in the tribute? I have seen Pete Seeger many times, I have sung with him many times, in Cuba, several times. When I met him the Sound Experimentation Group had already been formed. He sang with us on several occasions. I remember him singing in a concert that the Group gave in the Cinemateca Hall to welcome him to Cuba, many years ago. "Then we did a tour of several cities in Italy, dedicated to VÃ­ctor Jara. It was the late 1970s. On another occasion in 1980, when I was in the United States, we travelled to Poughkeepsie, he is from a place called the same way in the state of New York, it was one of the coldest nights, according to the press, of the last 80 or 50 years, it was less than 20 degrees below zero, a tremendous snowfall … "We arrived there, to the little theater of Poughkeepsie, where he had a concert to which he had invited Pablo MilanÃ©s and I. There I heard him sing a wonderful song, that I wanted to learn for the concert, but I did not have time to… I was thinking to include it anyway in one of my records. It is called Snow, snow, that are like the questions that someone is asking himself while watching the snow fall. It is a masterpiece, a wonderful song. 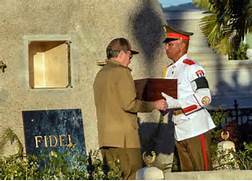 I am telling you, I have been with Pete … then here in Havana, we saw each other on many occasions, we have talked many times. We have a relative friendship, you can say, the friendship that comes from singing, from having a similar vision of the song, not identical but similar. This undoubtedly creates a brotherhood. Even though, I do not know why I was invited. They invited me because they thought I should be there. I felt much honored with the invitation and I think that even more important than having attended or not, is the fact of being invited. I think the opportunity was being taken of an apparently relaxed atmosphere, that the conflicting relations between our countries seemed or seem to be taking another path, and perhaps it was taking that moment as an excuse, to begin to re-establish a cultural link between the two peoples, between the two countries. I understand it that way and I think the fact that there are American artists and intellectuals who think that way, is the most important thing in all this. Sandra Levinson said in an e-mail from New York that it was an amazing concert, with top artists like Joan Baez, Dave Matthews, Tom Morello, Bruce Sprinsteen, Kris Kristofferson, Tim Robbins and dozens more … But she also regreted: "… If only Silvio could have been…" I ask, if Silvio could have been there, what would he have done? If I had been there, I would have done what we had planned … my participation was agreed by e-mail and telephone with Tao RodrÃ­guez Seeger, Pete’s grandson, who is a bit the one organizing this event. "Anyway, I do hope I will see him … either here or there. OjalÃ¡ (I wish)." In these moments the tribute concert that dozens of singers are justly offering you is being celebrated. Passing through my mind are some of the times that I have had the privilege of enjoying your talent, which has seduced multitudes. I remember you in Havana, singing in solidarity along with the Sound Experimentation Group; I remember you in that tour that was dedicated to Victor Jara, through several cities in Italy; and I am also reliving that frosty night in February 1980 in which, responding to your call, we traveled from New York to Poughkeepsie and we listened to your "Snow, Snow," the masterwork of someone asking questions of a winter landscape. I tried to come back to be with you today, but, as you well know, I was not allowed to get there by those who do not want the US and Cuba to get together, to sing to each other, to talk to each other, to understand each other. They are the ones who think that the world is divided into the powerful and the weak; the ones who only appreciate those who are rich and strong. They are the ones who do not forgive us for the fact that, even though we are small, we have decided to live standing up on our feet. Reality cries out that these brutes must be getting fewer and fewer in number, but somehow that minority still rules and gives the orders. Some of them saw danger in the idea that we would meet and that a simple act of brotherhood would symbolize two neighbor peoples who can agree in song and in affection. But not just me, dear Pete: all my worthy and no doubt improvable people admire you, respect you, and celebrate your honorable nine decades defending social justice, peace, and culture. Here no one sees you as a danger, but as an extraordinary friend whom we are not allowed to embrace as freely as we would like. That is why not just I, but all of this Cuba that loves you, blockaded still by the abusers, is at your side now singing your prophetic `We Shall Overcome’ and the `Guantanamera’ of our MartÃ­. A kiss for Toshi and a big hug for you .